Ramsarup industries ltd – A value pick? 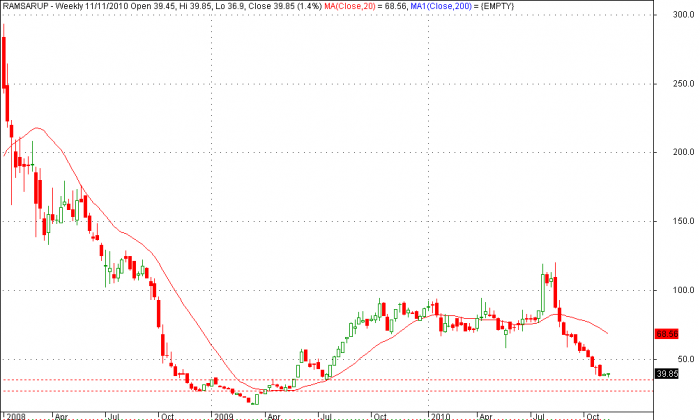 You are here: Home / Learnings / Ramsarup industries ltd – A value pick? Last pick BAGFILMS doing well. Now lets check Ramsarup Industries. Is it a value pick here? lets analyze. Technically Ramsarup Is highly oversold on weekly charts and daily charts. Its around support zone in weekly charts. Stochastic getting flatten which is a good sign of short term reversal. Volumes totally dried during phase of fall. So all over technically its a good buy until 26 with weekly supp @ 17. Now lets come to fundamental analysis part. Stock has a P/E ratio of 3.17 with market cap of 139 cr. It has a great book value with 163/shr where currently stock is under-priced. EPS at 12.56 looks good .Share holding pattern is less from FII’s . so all over its a great Fundamental pick too. Around 40 Rs its a good value pick both technically as well as fundamentally. So Investors can add this stock in your portfolio. @veer the above one is from jay. how reliable his call are? Just sharing my views based on technical and fundamental analysis. If U don’t want to take risk. Just track it.